coat 2 shallow roasting pans with extra-virgin olive oil. In one pan, place asparagus single layer in pan, sprinkle with a bit more olive oil, salt and pepper. In second pan, place tomatoes. Splash generously with more oil, a little balsamic vinegar, salt and pepper. Place pans in hot oven, roast about 10 minutes for asparagus, 20 minutes for tomatoes. Asparagus ought to be just soft and tomatoes smash easily when pressed with fork. Allow asparagus to cool slightly. mash lightly with pan juices to yield a savory roasted sauce. Gently stir in olive and pinenuts. sprinkle edge of plate with fresh chopped mint. 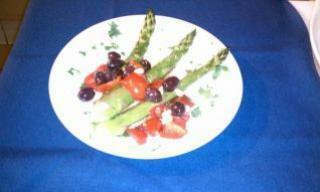 Place 3 asparagus in center of plate. Spoon some tomato-olive-pignoli mixture over center of asparagus trio. Drizzle plate with olive oil, and sprinkle with additional chopped mint and a pinch of salt and pepper to serve. Last week in my post about Lisa's and my exquisite experience at Venice's Gjelina, I promised my recipe for a dish with fresh summer asparagus that my guests love at BarComida. Note: The photo was taken by John Park, my lovely guest with his wife. So, at BarComida. This plate was made with garden-fresh cherry tomatoes that were too perfect to roast! If you are so blessed to have this quality of fresh tomato handy, by all means just chop them gently, mix them with oil, vinegar, olives, nuts, sprinkle the mint, and you're good to go!